DeGiro launched in the UK more than a year ago, so why am I suddenly interested in opening a new broking account? I mentioned back in October 2015 that I’m now eligible to draw money from my pensions (SIPPs). I haven’t done it yet, but sometime before April 5th I will be taking out enough money to use up my basic rate tax band (take my income for the year to around £43K). I plan to take money out of my pension as quickly as possible. Any money that I don’t spend will be recycled into an ISA. The thing is, I’ve already filled my ISA for 2016/17 and as my partner is still working, we don’t need to spend my pension income on living expenses. So for the first time in around 10 years, I have some spare money that I can’t put into a tax-sheltered account. I plan to use some of it to open a spread-betting account (I only have a dummy account at the moment). The rest will go into an unsheltered stock trading account. This is where DeGiro potentially come in. If you were to sum up the reception DeGiro received when they launched in June 2015, it would be “very cheap but they don’t do an ISA or a SIPP”. So now that I’m in the market for an bog-standard account, they are back on my radar. DeGiro was founded in Holland in 2008 by five guys from Binck Bank, the largest local online broker. Over the next two years they expanded into 17 other countries, before finally launching in the UK. They process €30 bn in transactions each year and have around €3 bn in assets on their platform. Opening an account is pretty simple – DeGiro use “derived bank identification” so there isn’t a lot of paperwork to fill out. The DeGiro website transfers you to a site called SoFort, which claims to make an instant secure payment into your DeGiro account from your bank account. I started this process, but it wanted my back account name and password, so I aborted that. 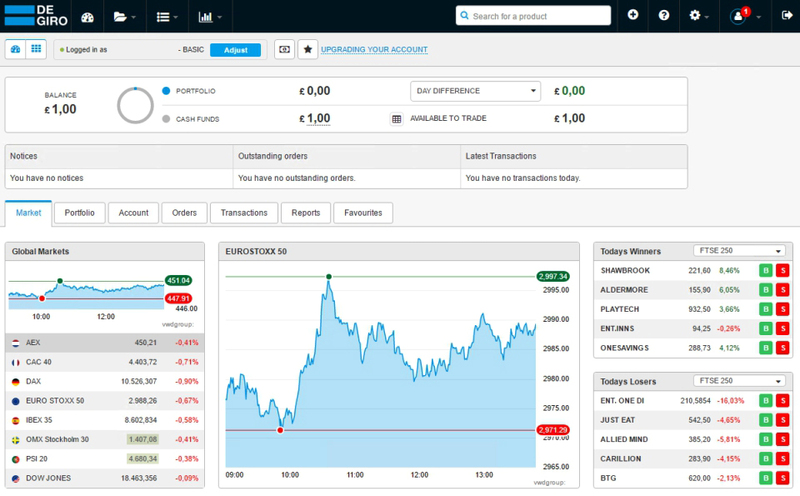 The SoFort system is limited to transferring £250 in any case, so you can’t use it to fund an account and immediately start trading. I still received confirmation on-screen and by email that my account had been opened. But when I tried to login, the system, rejected the username / password combination. I double-checked my username in the confirmation email, reset my password and tried again. But it still wouldn’t let me in. I tried another browser (Edge, after Chrome) but still no luck. I reset my password a second time and it still won’t let me in. I’m thought that maybe aborting the SoFort transfer had led to a problem with the creation of my account, even though I got messages that everything had gone ok. So I created another account with a new username, this time choosing the “manual transfer” option to send funds to the account. Again I got the confirmation email. And again, the username and password were rejected. So now I’ve sent an email to the customer service address. While I wait for them to get back to me, let’s find out more about the service. The main selling point of a DeGiro account is the low trading commissions. Told you it was cheap. The table below (from the DeGiro website) compares their charges with those of some other brokers you may be more familiar with. ETFs can be traded once per month (per ETF) for free, but there are no UK-listed ETFs under this offer. There are no holding fees or inactivity fees, or minimum number of trades per month. You can open an account for a company, but there is more paperwork involved. You can open an account for a child. There are no ISAs or SIPPs, though DeGiro have claimed in the past that they are on the way. Money goes in and out of the DeGiro account via a single nominated bank account. Live LSE prices are available, but are not free. Most international stock markets are covered, though I’m mainly interested in the UK. They also offer shorting plus CFDs, futures and options (though not UK options). One interesting “coming soon” feature is the ability to buy fractions of shares. You invest a set amount of money (say £1K). You say what percentage you want invested in each of a range of stocks. DeGiro give you fractional positions as needed. This would allow you to diversify any portfolio, no matter how small. Because DeGiro is incorporated and regulated – by the Dutch Central Bank (DNB) and the Netherland Financial Markets Authority (AFM) – in the Netherlands. DeGiro operates in the UK on the EU “passporting” rule, so it will be interesting to see what happens after Brexit. Because of the foreign regulation, UK investors are naturally interested in what happens if the company gets into trouble. The short answer is that you get your money back. Client funds and assets are segregated from DeGiro BV, the Dutch company. Because DeGiro is not a bank, it can’t use cash that it holds for its clients in its own investments. Cash is held at Beleggersgiro in Cash Funds. Client funds are not seen as recoverable assets under the bankruptcy of the firm. The money is ring-fenced at the custodian. The investor compensation scheme in Holland has a cap of €20K (rather than the £50K in the UK), but DeGiro feel this is unimportant because of their custodian arrangements. DeGiro is registered with the FCA, but not regulated by them. DeGiro support got back to me (via email) after the weekend. But by then the account login was working anyway. I filled in a couple more online forms and transferred a test £1 from my current account. Note the lack of live LSE prices. There are no SIPPs or ISAs, so you can only tax shelter £11K of gains each year. This means that accounts larger than say £100K are not attractive. Their custodian arrangements mean that this shouldn’t matter. I’m convinced enough to want to try the account, for UK and perhaps US stocks and ETFS, and UK investment trusts. I’ll write a follow-up article in a month or two letting you know how I’ve got on. I’m a Brit living in Sweden. There has been a bit of comment about DeGiro on various Swedish financial blogs due to the low charges, folk are very wary due to lack of perceived financial protection in case they go bust. Looks worth a further investigation. Client hereby gives consent to DEGIRO to Lend the Securities which are the subject of a purchasing Order or which are held for Client by Beleggersgiro. At all times DEGIRO will be the counterparty in this respect to Beleggersgiro and as such will have the obligation to redeliver the Securities that are Lend. A brief clarification of Lending is given in the document Investment Services in the Investment Services Information. The applicability of Lending is further described in the document Profiles in the Investment Services Information. If DEGIRO Lends Out Securities, then no asset segregation will apply in relation to such Securities. Instead, Beleggersgiro will have a right of redelivery against DEGIRO. In order to fully cover the risk that DEGIRO will not be able to redeliver the Securities that are Lent, DEGIRO will procure that Beleggersgiro holds collateral to the amount of at least 104% of the value of the Securities that are Lent. This way, Beleggersgiro will in all situations as much as possible be able to meet its obligations to Client. When DEGIRO Lends Out Securities, this does not change the Balance of Client with Beleggersgiro as, Client still holds a claim against Beleggersgiro expressed in the Securities that are Lent by DEGIRO. However, Beleggersgiro will not hold the Securities concerned at that moment but, instead, will hold (a security right on) money or other Securities as security. The Securities that are Lent will be allocated by DEGIRO pro rata to their holdings in such Securities to the customers for which Beleggersgiro holds or would have held the Securities on the account where the Securities were held or would have been held if they would not have been Lent. Quite a mouthful, but I’m not sure what point you are making. It’s pretty clear that they lend out your stock (unless you have a Custody account). But when they do, then Beleggersgiro has to hold 104% of the amount lent in other securities. Could you be clearer about what you see as the problem? From online reading and I am no expert!! So I post this as a precis of online stuff that I’ve read. It seems that DeGiro has close links with hedge fund HiQ. They share the same office, same board members. I am not suggesting there is anything illegal They post collateral 104%. Problem arises when things go awry. Imagine they are on the wrong side of an extreme event. HiQ goes bankrupt, as does DeGiro. It’s not a bank, the losses have to be covered from somewhere. The retail stock portfolios will need to pay. In a sense, all retail investors combined are a safety cushion for the hedge fund. If this happens, the official reaction will be : it’s in the terms and conditions. No mention of HiQ in your previous comment. The real question is whether Beleggersgiro is connected to DeGiro. That’s where the collateral is held. It shouldn’t matter who they lend the stock to. Have you any reason to think that Beleggersgiro is not independent? I can find very little info on beleggersgiro. I have no reason to suspect anything untoward . Just if it seems to good to be true it probably is. DeGiro launched in Ireland earlier this year. I read on a post that they wont / cant opt the investor into the script / DRIP dividend option on a stock even if its available. Have you heard the same ? I don’t use Scrip or DRIP – I don’t believe that dividends need to be reinvested into the same stock they came out of. I just let the cash pile up and then buy something else, so I wouldn’t have looked. I’ve heard that they hope to provide the service in the future but I wouldn’t hold my breath. I recently signed up to Degiro for their low transaction rates .. with my H&L account for longer term holdings. The only issue I had was to transfer money using Sofort from my Barclays current account.. I tried several times over a week – error after error. I contacted support and they told me to try a few days later, which I did – didnt work. Contacted support again and they finally told be that not all banks support Sofort, but they were not specific in saying that I could not use Barclays. In the end I gave up and had to use a standard bank transfer which took 2 days. Once the ££ was in, trading shares was easy enough. I guess in the future if I want a quick deposit, for a quick but – then this isnt going to be the site for me … i.e. deposit well ahead of time. 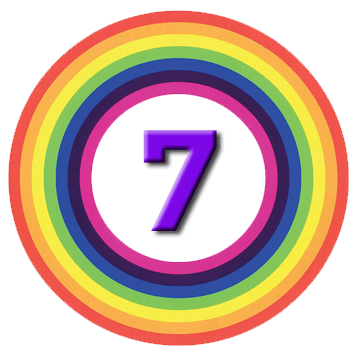 7 Circles > Costs & Taxes > Costs > DeGiro Stockbrokers – Everyday Value?